Officials with the University of Maine at Presque Isle and C-A-N-C-E-R are pleased to announce that the 8th Annual Planet Head Day raised more than $21,000 for the local cancer organization. Dozens of community members shaved their heads (or donned bald caps) and had them painted as planets, moons and comets for the region’s most unique fundraiser, which brings together space science education and cancer awareness into a single package. Planet Head Day is the major fundraising event for C-A-N-C-E-R [Caring Area Neighbors for Cancer Education and Recovery], an Aroostook County-based organization that assists cancer patients and their families. All monies raised during Planet Head Day will go to support area community cancer patients in treatment. C-A-N-C-E-R, a local organization made up entirely of volunteers—from its board to individual members, strives to help patients with travel expenses and other treatment-related expenses that are not covered by insurance or other programs. It has also, in special circumstances, helped in other appropriate ways to bridge gaps in the patient’s financial situation until a more permanent solution can be secured. There was much to do and see at this year’s Planet Head Day, which took place on Saturday, Feb. 15, in UMPI’s Wieden Gymnasium. Community members from throughout Maine and nearby Canada stopped by the University to enjoy the afternoon of food, fun, and science and cancer education. There were more than 100 “planetheads” of all ages orbiting around the gym. Crowds gathered around a row of barber chairs to watch one brave soul after another sit down and get a free haircut—a very close shave—from the staff of the Parsons Street Barber Shop and Great Beginnings Hair Boutique. Theatrical “bald” caps offered a less permanent option for participants. The resulting bald heads were in recognition of and support for the many cancer patients who lose their hair during cancer treatment. At a nearby cluster of tables, artists and planet head painters were on hand to transform those blank canvases into the celestial body of each person’s choosing, employing imaginative painting techniques and even hand-crafted cardboard rings for those opting to be Saturn. Money for the “bald” caps and paints were provided by a grant from NASA. The event is scheduled each year for the weekend closest to the anniversary of the discovery date for the dwarf planet Pluto (Feb. 18, 1930) and is part of the University’s educational outreach for the New Horizons program. Around the room, there was an assortment of displays related to C-A-N-C-E-R’s efforts and space education. In one spot, a children’s art area was set up to provide a fun activity for the younger attendees. In another spot, Lynwood Winslow of Presque Isle was again volunteering his time, laptop, camera, and printing technology to photograph each planethead and produce a certificate for each participant to take home. In the middle of the room, WAGM’s Ted Shapiro and UMPI student Andrew Hunt returned to emcee this year’s event. And at the far end of the gym, Pizza Hut once again provided free pizza. Planet Head Day was originally established as a NASA-funded celebration of the University’s involvement in the New Horizons space mission to Pluto, which is now only one year away from its arrival. 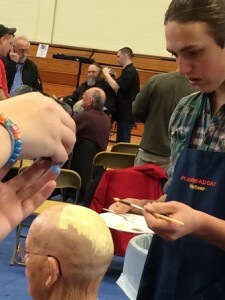 A video of this year’s Planet Head Day activities, provided by Frank Grant, is available on youtube at the following link:https://www.youtube.com/watch?v=SV4puWSPfFc&feature=youtu.be. Even though Planet Head Day is over, you can still make a donation to C-A-N-C-E-R. Donations can be sent directly to C-A-N-C-E-R, P.O. Box 811, Presque Isle, ME 04769, or call Louise Calabrese at 764-0766.